Colleagues recently have been speculating on the effectiveness of trying to write/revise/whatever at this time of year where there is so much competition for the daily hours. One says that in the absence of deadlines, it’s not very productive time and should be used to read. Another has produced a manuscript and is pleased with the outcome. Me, I’m somewhere in between. I didn’t have a deadline but did have some requested revision to do. Although the editor won’t get to the changes until mid Jan, it was a good exercise to do the revisions while the conversation with the editor was still fresh. And there’s been some tweaking on a couple of pb manuscripts. But other writing work? Not happening. It may be the season, but it may also be the builders and painters, who although commissioned in September-ish are still here. The builder is just gone, but the painter is in and out, fitting in all the ‘urgent’ jobs. His phone rings almost non stop while he’s here and he was astounded yesterday when someone wanted to know if he could fit them in before Christmas… We’ve been playing chess with the furniture for months. Empty this room, fill this one, now empty this one too. Move this lot from one end of the hall to the other, put the bed in the loungeroom. Now the painter has gone off to another urgent job and we’re in limbo. Will he get back? Should we start to put furniture back and empty the next room? Sometimes you just gotta go with the flow. Think we’ll invite the friends to enter via the back gate and feed them barbecue…that way they won’t even see the mess. Compiled by Jon Bard and with contributors from US, Canada, Australia and more, this new e-book features a collection of 64 children’s authors’ responses to five questions, including ‘The best advice I was ever given…’ and ‘I really need to tell you this…’. When I first started writing, not only did I not know anything – I didn’t even know what I didn’t know – so I didn’t know what questions to ask. Confused? Writing can be like that. What this e-book does is ask the questions…64 times. Authors from around the world have answered in a variety of styles, sharing knowledge and wisdom. Some responses are brief, some are less so. Some are philosophical, others more technical. What they all share is the voice of experience. There’s practical advice, humour and honesty. In fact, there’s something for everyone, no matter how they work, or where they are in their writing career. At the very least, this is an entertaining read and an insight into the minds of some well-known authors. At best, it will inspire and help you avoid potholes on the road to writing success. …or ‘Ensemble c’est tout’ if you prefer the French title. WARNING: Spoiler alert. Don’t read on if you’re planning to see this film. I was looking forward to seeing ‘Hunting and Gathering’, having enjoyed previous features with the gorgeous Audrey Tautou. And it was pretty – very pretty – with its wonderful French buildings and countryside.Camille (Audrey Tautou) was lovely, Frank (Guilliame Canet) is very easy on the eye. The other two main characters – Phillibert (from an aristocratic family) and Paulette (Frank’s grandmother) were both very interesting. I don’t know if this movie came from a book, but it felt like it might have. While (Audrey’s) Camille’s story was centre-stage, there were several other stories that warranted more exploration, I thought. Back stories for almost all the other characters needed more explanation to really make glorious the resolution. Thinking about the film afterwards, I had lots of questions. If Phillibert’s stuttering came from a troubled and emotionally under-supported childhood, why were his parents at the solo theatrical performance that marked his emergence from their shadow? And just where did his girlfriend come from? Why didn’t they all move into Paulette’s house? Who kept Paulette’s amazing garden and glorious pets in such wonderful condition for so long? What happened to the vacated ‘apartment’? When was the transition from being a temporary invalid in need of some TLC to permanent resident? I had a sense of bits having been cut out rather than never having been explored. I liked the relationships that evolved in ‘Hunting and Gathering’ and the sense of the power of community in enriching lives, indeed in many senses saving lives. I just wanted a little bit more. Today I’m host to South Australian children’s writer, Robyn Opie, on Day 2 of her blog tour. We’re talking about her chapter book, ‘The Pony Game’, illustrated by Elise Hurst, published by Hachette, under the Lothian imprint. 1. This was the first title of the series that was previously ‘Start-Ups’. So it was a sort-of relaunch for the series as well as a launch for you. Did that add anything to the pressure to get it right? Not with me. I was unaware of it being the first title in the series. I only found out after Lothian Books had accepted the story that they were changing the series name to Giggles. So, from my point of view, the work had been done. Unfortunately, they cancelled the Giggles series, not because of poor sales of “The Pony Game” I might add. The sales and reviews have been great. But I always feel pressure to get a story just right – as close to perfect as possible. I was pleased when the editor from Lothian Books made few changes to it. 2. 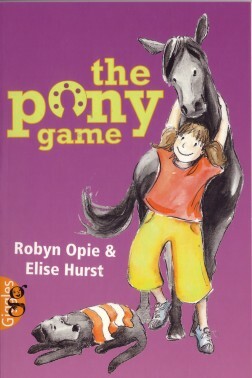 ‘The Pony Game’ is for young readers. How do you ‘get into the head’ of your target readership? I don’t do anything special. I just write as honestly as I can. All my characters are me to some extent, even the boys, and react how I think I’d react. I guess that’s what I do – put myself in the story, write about me in different situations. I’m a kid at heart. I’m not keen on the “adult” world. I like living in a child’s world. Things seem easier somehow, despite the problems I throw at the characters. I remember a teacher once telling me that I shouldn’t “wish” to grow up too soon, that being a child were the best years of my life. I didn’t believe him at the time. I was eager to grow up. But, when I did “grow up”, I realised that he was right – so very right – and I wanted to be a kid again. I am, through my writing. 3. Do you have a favourite age group to write for? What makes it special? My favourite age group to write for would be 8 to 12 and in particular boys. I don’t know why but I feel like I relate to boys better. I like writing funny stories with the main characters having humour and attitude, and it seems to work better for me if I write about boys. I think I find them less complicated. 4. Do you have a clear image in your head of how your characters look? Did the illustrator see them differently? No, not really. I only describe my characters if it is necessary to the plot/story. I know my characters more by the way they sound and act, rather than by the way they look. I guess that’s because they’re all me. I got a shock when I first saw my character “Ben” from my Wings titles published by Era Publications. He’s African American. I’m not racist. It was just a surprise the first time because I automatically “see” my characters as English descendants like me. All my characters are like me – at least the human ones. Lucy from “The Pony Game” is pretty much how I pictured her and that’s nice. I imagined her as a cute little girl – and she is. 5. How did the idea for ‘The Pony Game’ arrive? Was it fully formed, or in pieces? I’d just finished a non-fiction book “Looking After a Pony” and contacted a local riding club for help with photos. We needed a pony and a child for the photos. Once the book was published, I met with the helpful lady from the riding club and gave her some copies of the book. While she was talking, I started to think about her passion for horses and riding. It was hard not to – her passion for horses is as obvious as my passion for writing. She reminded me of my best friend at primary school, who was horse mad. These memories of my childhood floated around in my head until a fully formed story popped into my mind. That’s the way I like to work because it’s the best way for me. I think of an idea, ponder it a bit, then leave it alone. The idea is still in my head but instead of me consciously thinking about it, my subconscious is running with it and, seemingly out of nowhere, it gives me a fully formed story. Sometimes it feel so easy – like magic. Thanks, subconscious! 6. Were you a pony-loving child? If so, was it a long-time passion, or a passing fancy? I love animals – all animals. But dogs have always been my favourite. I like horses but I’ve never been a “horsey” person. My best friend at primary school was. Curiously, though, the first two houses I lived in – up to the age of seventeen – had horses living behind them. The first house in Port Pirie had a horse stable behind in the next street. The second house in Adelaide backed onto the banks of the River Torrens, where people kept horses. So, for a long time, I had horses living over my back fence. For a while, I looked after a horse on the River Torrens. It was a cranky thing – kept trying to bite me. It didn’t like being ridden even. As Lucy found out in “The Pony Game” looking after a pony/horse can be hard work and it is definitely a daily commitment. I thoroughly enjoyed it, though. They are beautiful creatures. Thanks Robyn, enjoy the rest of the tour. For Day1- Mon 10 Dec – visit Tina Marie Clark’s What is Happening in my Office? I signed some more books at Mockingbird Bookshop yesterday (they’d not arrived in time for our gig last week) and had morning tea with my folks at Zimt, a wonderful patisserie around the corner. A friend of my parents bought ‘A Nest for Kora’ when it first came out and reads it to her grandchildren (thanks Margaret). She reports that one of her grandchildren loves Kora so much, she can’t visit without taking ‘the chookie book’. Her grandson knows all the words, has given all the chooks names and insists on multiple rereadings. Books Illustrated, the wonderful children’s bookshop and gallery at Gasworks Park in inner Melbourne is closing. This bookshop, owned by children’s book champions, Ann James and Ann Haddon, has been a wonderful place for all those interested in children’s books. The upstairs gallery has featured wonderful exhibitions of original picture book illustrations and also hosted book launches, industry gatherings, and many other events in its 15 years. It will be missed. But hopefully for Ann and Ann, it will mean time to pursue other interests, other challenges. They have plans for the future and I look forward to that. A new children’s bookshop has opened in my local area, at Yarraville. I have long been a fan of the Sun Bookshop, a small independent bookshop under the roof of the wonderful, Art Deco Sun Theatre. (I could wax lyrical about the small and large cinemas in this building, but will save that for another time). The Sun Bookshop is stacked to the rafters with all manner of books and includes a substantial children’s book section. Now that has been expanded further with the opening across the road of ‘The Younger Sun’, a dedicated children’s bookshop. To my knowledge, it is the first children’s bookshop in the west of Melbourne. Well overdue and deserving of great attention. Congratulations Deb, I hope it does well. Judith Rossell and I were at Mockingbird Bookshop in Mont Albert yesterday for a booksigning for’ A Nest for Kora’. Judith illustrated ‘A Nest for Kora’. The bookshop also had copies of some of Jude’s puzzle books and my ‘Ebi’s Boat’. Jude had brought offcuts of the paper she paints on and was drawing/painting wonderful little animals for children (and a couple of adults) on bookmarks. It’s not quite as easy for a writer to provide something to go home with, but I tried. I wrote some silly limericks based on children’s names and then made some paper boats. We sold some books and had a lovely time. Evelyn Snow, owner of Mockingbird Bookshop and her staff, looked after us royally. It was memorable…this time in a good way.